Visit the DCI Fan Network. The 21st episode of "Madisonic" shows members of Madison's cymbal section performing their 2008 Individual & Ensemble production titled "Kill Bill" after the Quentin Tarantino classic. The ensemble scored 93.0, good for second place at the competition. Watch it on the Madison Scouts Fan Network. During the July Troopers' 50th anniversary celebration in Cheyenne, Wyo., the corps asked alumni to practice and perform with corps members. Check out a video of the rehearsal and performance on the Troopers Fan Network. Watch it on the Troopers Fan Network. The banana-jacketed Bridgemen Alumni Corps brought the house down with their special exhibition performance at this year's DCI Eastern Classic in Allentown, Pa. 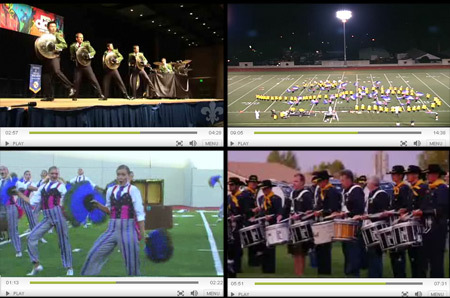 Check out their entire 14-minute production on the DCI Fan Network. Watch it on the DCI Fan Network. A video recapping the 2008 Drum Corps International World Championships that was shown on the stadium video board during the finale of the World Class Finals can now be seen on the DCI Fan Network.